Peru’s Onpe designed a voting machine, but it will test out technology from three foreign companies. On July 7th, Peru will once again carry on the task of showing the country the benefits e-voting can bring to the electoral system. The National Office for Electoral Processes (ONPE) invited three companies to test out the effectiveness of their technology in the Cañete district in the town of Pacarán, during the recall referendum for municipal authorities. The foreign expert companies deploying their faculties in Peru are Smartmatic, a London-based multinational, Colombia’s Voting Solutions, and Argentina’s Magic Software Argentina (MSA). The goal for all of them is to exhibit what their electoral technology can do to modernize suffrage. ONPE’s call for next month is a good opportunity to show the world the advances that allow different countries in the region, as well as others from Europe and Asia, to have safe and reliable automated elections nowadays. Smartmatic will show in Peru a technology that can cover all the stages of the elections in their entirety, from project management (logistics, recruiting, and training) up to satellite communication services, plus all the equipment to hold a completely automated voting event. Smartmatic´s solution for Peru involves biometric devices to authenticate the voters at the polling station, and touch screen voting machines to capture the voters´ intent. All of this while scrutiny, tallying, and transmission are done electronically. The equipment has modules to facilitate voting for citizens with motor, visual, and hearing disabilities. Colombia’s Voting Solutions will work with a touch screen machine that contains a kit for the visually challenged (number keyboard and headphones). It also has an “administrative terminal” to incorporate the voting registry and thus identify voters for giving them access to the machines. Besides, it offers the option of biometry and digital signature. The third invited company is Argentina’s MSA. Their machine works with software that allows the voter to “navigate” through the options to vote. It has a printer that reproduces the vote, and it also has mechanisms to store selections digitally in a chip. 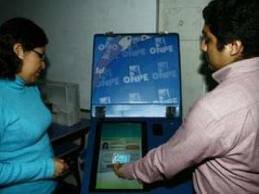 The machine also has a vote verifier and an assistance kit for the visually challenged. These companies will accompany Peru in the new electoral event, and although at first glance they might seem to have similarities in the components of their equipment, they are vastly different in their method to shield suffrage and the whole process (encrypting, digital signatures, auditing possibilities), as well as in their capacity to attend to the production requirements. ONPE will have to consider which system adapts best to its necessities and select the most appropriate one to carry out its so-called litmus test: next November’s complementary elections. In this event, voting will be automated in two districts in Lima, where 1 million people are expected to vote. Spain’s National University of Distance Learning (UNED) held an electoral process supported by online voting which, according to early analyses, allowed to raise the level of participation among this institution’s community. UNED is the first higher education institution to use electoral technology in its elections. Read the election’s results here. Two facets of the debate over e-voting were revealed during the visit Tibisay Lucena, president of Venezuela’s National Electoral Council, made to Dominican Republic: the exportation of electoral technology and the fact that bi-national cooperation shortens the path to the adoption of voting technology. Venezuela offered the Caribbean nation as many voting machines as it needs to implement e-voting. Their use would be free for at least the first trials. The possibility that Venezuela is offering the Dominicans is of utmost importance, as it provides benefits to both parties: while the receiving end gets to have a proven voting model, the sponsoring party can show the world its advances in electoral automation and stimulate its application in other regions. Venezuela, which initiated migration from manual to electronic voting in 1998, spun around its technology in 2004 when it began automating suffrage in its entirety. Nowadays, it has a system that is capable of identifying each voter, voting, scrutinizing, tallying, and transmitting results with the support of devices and programs. Besides, its e-voting model is auditable in all of its stages. The experience of the South American country will be replicated for now in the Autonomous University of Santo Domingo. This way Dominican Republic, a country with a history of electoral problems and irregularities, will be able to take the leap to modernity in 2016 and deliver its citizens a safe electoral mechanism. The president of the Central Electoral Board (JCE), Roberto Rosario, already calculated that if adopted, the acquisition of this technology would cost 15 million dollars. Change always entails its costs, but when it comes to guaranteeing the people’s will, the investment is directed at strengthening Democracy. Venezuela understood so, and after more than 10 elections with flawless results, it is about to export its e-voting model. Moreover, Dominican Republic is joining the group of nations that left doubtful elections full of flaws behind in order to seek development, thus protecting its political future.